According to IMWG response criteria  the current definition of CR requires the absence of the monoclonal protein by IFE and <5% bone marrow plasma cells . However, this definition is not satisfactory for several reasons. Firstly, monoclonal protein quantification by electrophoresis measures only the product of the secreting clone, and not all MM plasma cells are secretory . Secondly, recycling of IgG by the FcRn receptor may prolong the persistence of IgG monoclonal proteins in the serum, causing IFE to remain positive long after the tumour has been eradicated (Section 3.5.3) . Finally, IFE is a subjective technique, and interpretation can be difficult, leading to discordance in the response category assigned by different operators . With the introduction of highly effective, novel therapies to treat MM, assays with increased sensitivity are required to improve the detection of residual disease and allow more precise comparisons of treatment responses . With this in mind, IMWG response criteria have been revised to incorporate a number of new response criteria. Firstly, a more rigorous sCR category was defined, which incorporates sFLC analysis (Section 18.2.2) . This was followed by new categories of minimal residual disease based on flow cytometry, gene sequencing or imaging techniques (Section 25.3.5) . The guidelines also discuss a potential role for Hevylite to further improve the definition of MRD and recovery of normal plasma cell populations following therapy . A number of studies have shown that abnormal HLC ratios may indicate residual disease in IIMM patients whose electrophoresis results have normalised following therapy . Ludwig et al. used Hevylite to assess response in IgG and IgA MM patients. A total of 100 IgG and 56 IgA patients were followed for a median of 46.1 months. 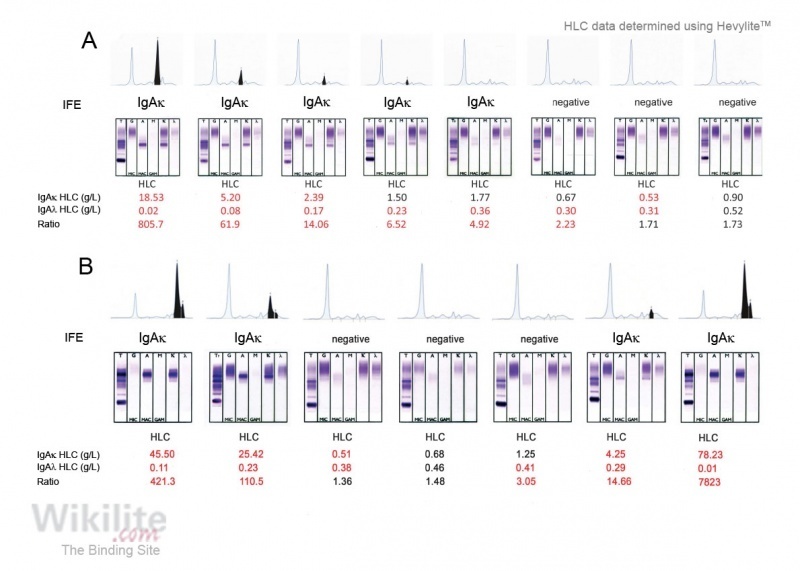 Hevylite results were compared with data from SPE, IFE, nephelometry and sFLC assays. Following induction therapy, a CR or sCR was observed in 31 patients. Residual disease was indicated by an abnormal HLC ratio in 8/31 patients – in four of these HLC was the only abnormality, and in the remaining four, abnormal HLC and sFLC ratios were observed. Figure 18.14A shows an example of an IgAκ MM patient who achieved a CR during follow-up . The monoclonal IgAκ became undetectable by IFE, but the IgAκ/IgAλ HLC ratio remained abnormal due to HLC pair suppression. After further follow-up, the HLC ratio normalised. In this case, the κ/λ sFLC ratio showed a similar trend to the HLC ratio throughout the study. Miyazaki and colleagues  studied HLC results in 45 MM patients who had responded to treatment and achieved negative sIFE and normal sFLC ratios. In this group, 7 and 9 patients had abnormal HLC ratios and HLC pair suppression, respectively. The authors concluded that the addition of Hevylite measurements to IFE and sFLCs improve the sensitivity of residual disease detection. It has been reported that patients with an abnormal HLC ratio at maximum response have a significantly worse outcome than patients in whom the HLC ratio normalises  (Chapter 20). An abnormal HLC ratio may be the result of HLC pair suppression (as illustrated in the case by Ludwig et al. discussed above). HLC pair suppression is an important prognostic marker, and has been shown to identify patients with inferior progression-free survival  and overall survival  (Chapter 20). HLC analysis may have an important role in the definition of a MRD-negative state: in particular, an increase in the uninvolved HLC concentration to normal levels following successful therapy may indicate immune recovery. This was mentioned in recent IMWG guidelines , which discuss how normalisation of HLC ratios in combination with the absence of MRD (by cell-based assays and imaging techniques) may represent a composite endpoint. Such an endpoint may confirm the eradication of tumour cells from all compartments and the recovery of normal plasma cell populations. An initial prospective study by Campbell et al. concluded that normalisation of both HLC and FLC ratios serves as a useful surrogate marker for MRD-negativity by flow cytometry, and correlates with improved MM progression free survival (Section 20.6). Further study of Hevylite as a marker of MRD is encouraged.